To Upload or Change Your Company Logo, Go to Admin > Themes > click edit button on theme. The height of the logo must be less than 200 pixels and the width must be less than 210 pixels. Larger logos are re-sized automatically. For best results, the logo file should be in GIF or PNG format with a transparent background. Click on Choose File to select the logo file stored on your computer. Double click on the logo file to select it. The file name is displayed so you can make sure you've selected the correct file. Click Save to complete the upload process. The logo is updated immediately. Edit the contents of the Application Name field. Scroll to the bottom of the settings page and click Save; the update is applied immediately. 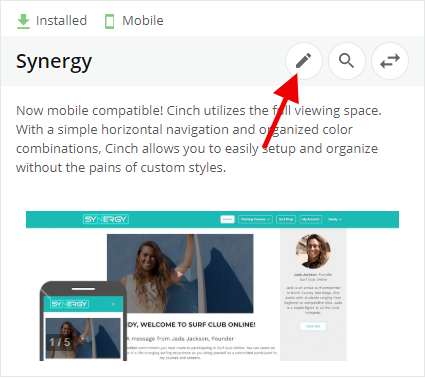 Browse through the available themes and click the pencil icon on a theme to make edits to the default colors, font styles, and add a logo to match your branding. Each theme has easy-to-use tools that help you with basic color and font style customization. You can also customize the site's CSS Stylesheet for more advanced customization. Refer to the image map to see what colors you can customize. You can also use this area to preview color changes before you save them. Go to the color field for the item you want to change.If you know the hexadecimal code for the color you want to use, click into the code field to update the color code. The "#" symbol is required.If you don't know the hexadecimal code, want to add RSB / HSB code, or just want to experiment, click on the small colored square next to the hex code to access the color picker. (Optional) Preview the color change in the image map above. (Optional) Repeat this process to edit additional color fields. Click on Site Preview to view the customer / member portal and see the color changes.